It is year 13 of the home redecoration 5 year plan, and time to completely refurbish the master bedroom. (Mistress bedroom would be more appropriate!). This puts all wargaming activities on hold and means that painting must be restricted to items over 30mm tall. It also is the cause of a major upheaval in the household, as the room where everything without a home is stored must be emptied. This includes about half a ton of wargaming magazines and publications that need to be sorted, filtered and the lucky survivors found a new home. Well, it is better than “cold turkey”. While “sorting out what to get rid of darling” I can look at other people’s games and get inspiration for when life returns to something like normal. The decorating is finished and the furniture is being built. I did manage to get a wargame in while waiting for the furniture delivery. I played a game using my “Napoleonics on ASL boards” system. This game uses my collection of old Advanced Squad Leader boards and 13mm square plastic counters representing companies of line troops or platoons of skirmishers. The mechanics are quite simple. Each hex is 20 paces across, a little less than half the stated size in Avalon Hill’s design, but more realistic given the layout of buildings and roads. 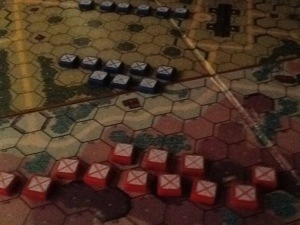 The hardest part of the game, given that the terrain boards were intended for World War Two close combat, is keeping the regiment’s companies together in anything like a line. Perfect for some of the broken terrain encountered in Spain. Firing is by company. Light companies and designated light battalions, rifles, etc. can split a company into three platoons to work in difficult terrain. Companies that take more than 6 hits are inverted and morale works on the basis of rolling more than the number of inverted tiles. After the morale check the inverted tiles are removed. Combat bonuses are given for formation, flanking and type of troops. This is an absorbing game with minimal set-up time that can be fought to a conclusion in a couple of hours, with the advantage that the losing army can retreat to a new random board at the end of the battle, and the game can be continued on another occasion.